Regularly voted as the best by drivers from all over the world, the Circuit of Spa-Francorchamps is one of the most legendary motorsport tracks. A regular theatre since 1985 of the F1 Grand Prix of Belgium, this celebrated track, the longest in the world championship at a little over 7 km, well deserves its official status as "the most beautiful circuit in the world". A global label that is rarely disputed and must be due to the Spa loop's undulating profile, its quick corners, with its famous and unique Raidillon, of course, but also to its natural and majestic setting, surrounded by fir forests in which the roar of the engines reverberate. A real jewel that is continuously adapting to the latest FIA safety standards. An historic Belgian monument as well known throughout the world as the Atomium or the Grand Place in Brussels. From Juan-Manuel Fangio to Alberto Ascari in passing by Jack Brabham, Bruce McLaren, Jim Clark, Alain Prost, Ayrton Senna, Michael Schumacher, and not forgetting Henri Pescarolo, Fernando Alonso, Tom Kristensen, André Lotterer, Jacky Ickx, Thierry Boutsen, Sebastian Vettel and Lewis Hamilton, the greatest names in international motorsport have triumphed there at one time or another. Permanent for several years now, Spa-Francorchamps is today a real hub of tourist attractions and sporting events which hosts the F1 Grand Prix of Belgium, the 24 Hours of Spa, the WEC, but also all kinds of activities, national races and foreign championships, trials, track introductions, visits and incentives on a track that operates for 8 months each year. The Circuit de Spa-Francorchamps recently made a major switch to digital to become a 100% fully-connected circuit, with free WiFi offered to the public and numerous new services to come. The fan experience is part of its priorities and facilities are being constantly improved to better host the public and provide increasingly more efficient services. It will soon celebrate its centenary by means of an exhibition to be revealed in 2019. The toboggan of the Ardennes, better known under the name of Circuit of Spa-Francorchamps, has the distinctive feature of not having even the smallest part of its track located in the Commune of Spa. Nowadays, the track is solely concentrated in the Malmedy and Stavelot municipal areas. This is one of the favourite circuits for drivers because of the variety of the track in the hilly landscape of the Belgian Ardennes that allows them to showcase their talent. Dan Gurney used to say that this circuit "separated the men from the boys". Designed in 1921 by Jules de Thier and Henri Langlois Van Ophem, the original 14,981 km track essentially had the shape of a triangle connecting Francorchamps, Malmedy and Stavelot and used public roads open to traffic in normal time. It became permanent in 2000. No fewer than 100 metres difference in height separate the summit of Combes and the Paul Frère Corner. The current track has been modified on several occasions and henceforth is a permanent 7,004-metres-long circuit of development.  It is still a very fast and undulating circuit, taking up part of the former track, which presents features appreciated by the greatest drivers in the world of various categories. Spa-Francorchamps is also known for its abrupt changes in weather conditions. La Source, also called the hairpin Source corner, is the first difficulty to be broached following the start. Designed in a U shape, it is the slowest corner on the circuit. It draws its name from the various water sources in the region, particularly in the Spa area. L’Eau Rouge is a stream running under the little bridge at the foot of the Raidillon. Anglophones allude to Eau Rouge and include the Raidillon without always naming it. The Eau Rouge is a tributary of the Amblève river which served as the border between the Roman and German empires and later between Belgium and Germany. Built in 1939, the Raidillon (literally the small steep road) has a drop of approximately 40 metres, from the start of the curve to the exit from the bend. It features a very impressive ramp which follows the descent of the cars after the hairpin of La Source. The sequence of movement, considered by numerous drivers as the most beautiful triple difficulty in the world, requires great mastery, not just to stay on the road, but also to approach the straight line leading to Combes at the highest possible speed. Drivers find themselves faced with a wall and a succession of left, right, left corners without being able to glimpse the summit. The Raidillon replaced the former tight bend of the old customs post with a shorter and faster design. Over the course of its very long history, the Circuit has adapted to the development of motorsport to respond to standards and safety requirements from the associations responsible (currently the FIA), without losing its soul as a very select Circuit, both for drivers and mechanics. The centrifugal force exerted by it requires great adroitness and superb knowledge of the area. Le Kemmel. The Kemmel ascent leads from the Raidillon to the Combes corner via a long ribbon of tarmac characterised by a slope and curve which is easily taken to the max. The highest speed of the circuit at any given time is located at the end of the Kemmel climb. Les Combes. The chicane of Combes (definition: small incised valley or gorge) is a very technical part of the circuit. A quick right-left pif-paf opens onto the bend to the right which determines speed at the moment of approaching the descent toward Bruxelles. Bruxelles is a bend curving to the right which appears to be never ending. This bend has also been called Rivage, from the name of the village nearby. Just after this challenge, a curve to the left, seemingly insignificant, has often taken drivers by surprise. This little left is also called Speakers Corner because the only place this curve can be glimpsed is from the former speakers' booth. The double gauche du Pouhon is a major challenge on the circuit. After a straight line of descent, Pouhon is negotiated at dizzying speeds. On the etymological level, Pouhon is a ferruginous mineral spring which has given Spa its renown. The word means the place where the water springs from. Fagnes. The double bend of Fagnes is approached at very high speeds as it follows a small right line after a very fast double-left. The name used refers to the Fagnes (fens) region as the village of Francorchamps is located there. Campus. The Campus corner is a fast corner curving to the right and its name comes from Campus Automobile adjacent to the track. This is a centre of competence, specialised in technological training, aimed mostly at engineers and technicians. The training centre is active in subjects such as the automobile industry occupations, motorsports and in technological research. La Courbe Paul Frère. The Paul Frère corner is located at the junction between the 7004-metre track and the former portion of the circuit climbing from Stavelot towards Blanchimont. Paul Frère was the greatest racing driver and journalist of all time. Creator of numerous victories in Sport-Prototype, he finished 2nd in the Belgian Formula 1 Grand Prix in 1956. Invited by Enzo Ferrari, he took part in his 11th and last Grand Prix with an unprecedented performance. Blanchimont, which holds onto its eponymous village name, is a double bend that is particularly difficult to negotiate given the speeds attained. The tarmacing of all external clearances has made passage considerably safer. La Chicane. The last challenge to approach is a slow corner in an S which bears the slightly unoriginal name of … Chicane. In the old days, it was alluded to as the "Bus Stop" as there used to be a bus stop there when the track was open to traffic at certain times. The right-left is particularly tight and negotiating it with good timing is essential, not only to end a fast lap in optimal conditions but also to start the next one well. After the chicane, the straight line leads the racing cars to La Source and we're off again!